Thanks to Joshua for this fine review of the NRSV Pocket Gospels and Psalms from OSV. Amazon also allows you to "look inside" which you can do here. The New Revised Standard Version (NRSV) has been a favorite of mine for over 20 years now. I have seen it various editions ranging from study Bibles, pew Bibles, audio versions, eBooks, to plugins for Bible software. However pocket editions have been far and far between. 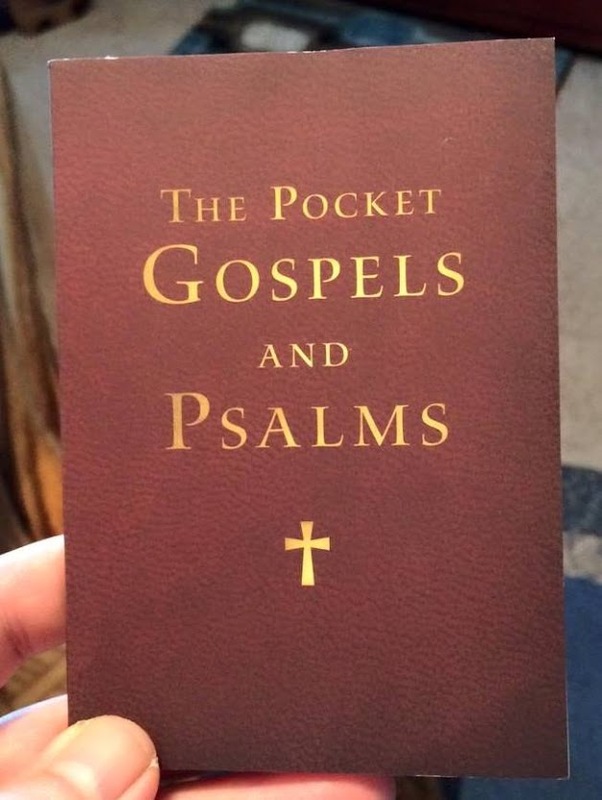 The last pocket edition I've seen was The Faith-Sharing New Testament with the Psalms. This edition was released in the late 1990s by Cokesbury, a publishing company owned by the United Methodist Church. Besides the text, it had an essay about the basics of conversion and discipleship. There is an edition by Cambridge that has the anglicized NRSV New Testament and Psalms. I have not seen this edition in person. I ran into Our Sunday Vistor's (OSV) The Pocket Gospels and Psalms by chance last fall; I was looking for new translations of John (which is my favorite Gospel). It looked intriguing and I mentioned to people I know on Facebook. Last Christmas, I ordered the Bible online. The first I noticed was the size of the book. It is small; it easily dwarfed the mailer it came in. 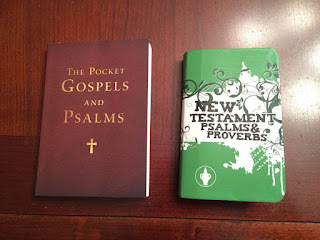 I compared the Bible with a pocket New Testament published by the Gideons (this organization places Bibles in hotels and other places) and a mass-market paperback. The Bible was about equal in size to the Gideon New Testament and smaller than the paperback (see the attached pictures). The size of the book was made apparent to me on New Year's Eve. I went to a store to do some shopping; I took the book with me in a jacket as I wanted to read from it after I finished. It was so small I forgot it was there and had to feel for it! The cover is burgundy with a matte finish. The contents and a small cross appear in gold on the front; the publisher's name, a bar code and the ISBN appear on the back. The cover also has a faux grain pattern, which is a nice touch. Turning to the paper, I'm pleased to say it is a nice white color. Ghosting is kept a minimum. The type size for the text is not the same as the Amazon sample; it is about 8.5px with the type size of the footnotes being smaller. My only real complaint about this Bible is that the type size for the footnotes is too small. I wish that OSV made the type size larger and placed the notes in a horizontal line across the bottom of the page rather than grouping them together in the corner. 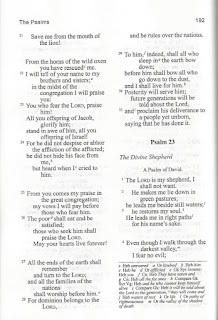 (See the scan of Psalms to see how the layout looks.) Canon Law requires that Bibles have "necessary and sufficient annotations" in them. The only notes this edition has are the standard translator footnotes, which aren't as detailed as the ones found in the NABRE or in other Bibles. A concern I have about this edition is that it does not have an Imprimatur. The only mentions of the Imprimatur are mentioned in the preface where it states that the NRSV has the "ecclesiastical approval of the Catholic Bishops of both the United States and Canada" and the "latter edition received the Imprimatur (official approbation) of the United States and Canadian Catholic Bishops". The preface is abridged from the one found in a regular NRSV-CE. It is also worth noting that Bruce Metzger's preface to the NRSV isn't printed. In any case, I would think that the Imprimatur and the Metzger preface is something that would be included. Overall, this is a beautiful, portable edition of the gospels and Psalms; I recommend it. Not only does it help heed the Holy Father's advice to "carry [a pocket Bible] with you and read it every day", it is a way to share the wonderful news with a generation that knows more of Kim and Kanye than Mary and Joseph. I also think it is a very good way to test drive the NRSV before buying more elaborate editions. In a practical sense, it is also a good way to effectively use those idle moments we have such as waiting at the doctor's office. What's better? Reading the words of the Lord or texting and talking on our phones? In any case I believe The Pocket Gospels and Psalms will do much good no matter how it's used. Thanks...nice review. I don't use hard copy pocket Gospels as I have a couple versions on my iPhone...easier way for me to heed Pope Francis' advice. I ordered the OSV Gospels & Psalms too, online, and was dismayed when I opened the package and saw the very small typeface, much too small for my old eyes. I was disappointed because I was looking forward to receiving it because of its supposed flexible plastic cover--it would hold up better in my pocket. The one I got from Amazon came with an ordinary cover, just like the USCCB edition. What the USCCB edition has going for it is that it has easier to read typeface, but at the cost of the book being a bit too large for an ordinary pocket. It seems to me that the typeface could have been larger in the OSV version if they had left out the Psalms. 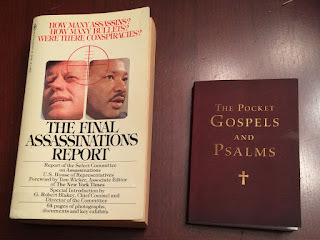 Some publisher ought to be able to produce a good little pocket-size Gospels with a soft plastic cover (and perhaps leather, too, as suggested by Mark DeForrest) and typeface that is not a strain on the eyes. By the way, that same evening I gave my OSV edition to someone at church who is much younger than I, and he wasn't sure he'd be able to read it either because of the small print.